The conservatory awning in a timeless, modern design. The round cassette and angular guide tracks harmonise perfectly with one another and with the shapes found in contemporary conservatory design. When fully extended the rounded front profile sits flush with the end of the guide tracks. This awning came with Markilux’s tracfix option. 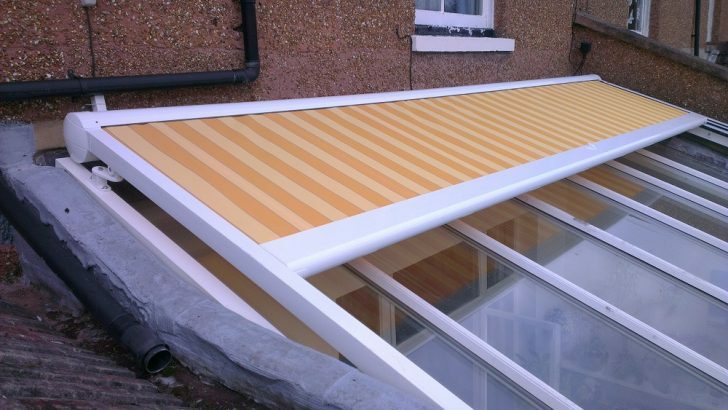 The tracfix system integrates in to the guide track making the awning extra sturdy in squally conditions. The cover runs continuously level with the guide tracks in a kind of zipper and thus is less susceptible to wind. Fitted by briteblinds in Brighton, East Sussex. Awnings, Conservatory awning, featured, Markilux, Sussex brighton, conservatory awning, hove, markilux, markilux 8800 conservatory awning, markilux awning. permalink.